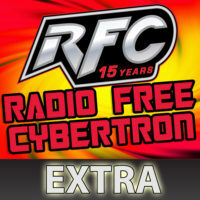 This week on RFC – Extra: Diecast and Anthony just got back from Toy Fair 2017 and they’ve provided audio from the Hasbro Q&A which occurred after the product presentation Saturday! Questions were fielded by the Transformers design team from various fan sites in attendance. RFC Extra 030: Toy Fair 2017 Sunday Live Stream: Non-Transformers, and Transformers too! This week on RFC – Extra: Brian, John and Diecast get together to talk about the Last Knight trailer that debuted during the Super Bowl!